When one thinks of our national parks, the last thing that they think of are places of worship. If you think about it, what better places to build them than in front of the Earth's most beautiful sites? 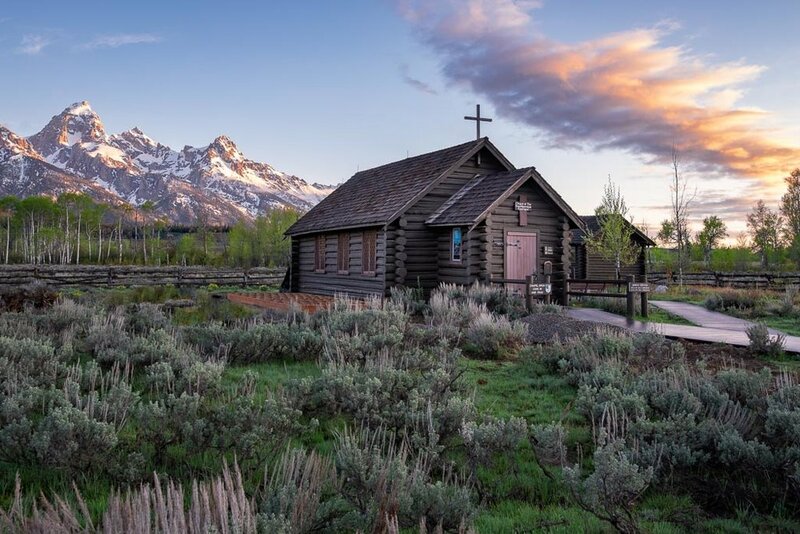 There are two that are in Grand Teton National Park, and this one, the Chapel of the Transfiguration, has the best view of the Tetons. Built in 1925 before the establishment of the national park, this Episcopalian chapel has a view of the Cathedral Group of peaks from both inside and outside the chapel. It was originally built to serve the many dude ranches that were located in the area. I have shot this many times in the past but always in the afternoon. Last week, I was able to shoot it at sunrise, which is the best time of day for this location. This early in the morning is a terrific time to take in the soft early morning light along with the majesty that God has created as a background.